A statue of Pope John Paul II with an image of the Virgin of Guadalupe, near the Metropolitan Cathedral in Mexico City. The statue was made entirely of metal keys donated by the Mexican people. In 1983 Poland's Communist government unsuccessfully tried to humiliate John Paul II by falsely saying he had fathered an illegitimate child. Section D of Służba Bezpieczeństwa (SB), the security service, had an action named "Triangolo" to carry out criminal operations against the Catholic Church; the operation encompassed all Polish hostile actions against the pope. Captain Grzegorz Piotrowski, one of the murderers of beatified Jerzy Popiełuszko, was the leader of section D. They drugged Irena Kinaszewska, the secretary of the Kraków-based weekly Catholic magazine Tygodnik Powszechny where Karol Wojtyła had worked, and unsuccessfully attempted to make her admit to having had sexual relations with him. Bertone, Tarcisio. "The Message of Fátima". The Holy See. Archived from the original on 21 August 2014. Retrieved 1 January 2009. 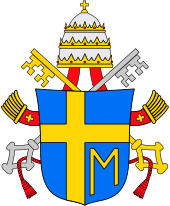 "Cause for Beatification and Canonization of The Servant of God: John Paul II". Vicariato di Roma. Archived from the original on 30 December 2009. Retrieved 1 January 2009. 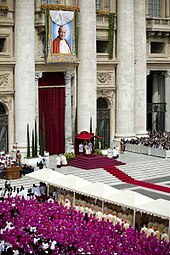 "'Cured' Pope Returns to Vatican". BBC News. 10 February 2005. Retrieved 22 October 2014. Domínguez, Juan (4 April 2005). "Pope John Paul II and Communism". religion-cults.com. Archived from the original on 6 April 2004. Retrieved 1 January 2009. Dziwisz, Bishop Stanisław (13 May 2001). "13 May 1981 Conference of Bishop Stanisław Dziwisz For Honorary Doctorate". CatholicCulture.org. Retrieved 1 January 2009. "Frail Pope Suffers Heart Failure". BBC News. 1 April 2005. Retrieved 22 October 2014. 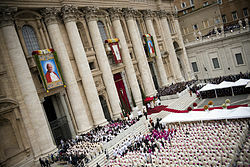 "Pope Back at Vatican by Easter? It's Possible". NBC News. Associated Press. 3 March 2005. Retrieved 1 January 2009. Editorial (5 April 2005). 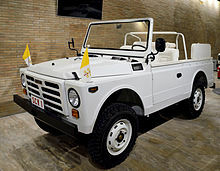 "Pope John Paul II". Voice Of America. Retrieved 2 February 2014. "Pope Returns to Vatican after op". BBC News. 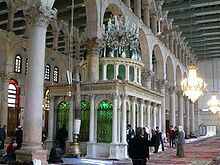 13 March 2005. Retrieved 22 October 2014. Sean Gannon (7 April 2006). "Papal Fallibility". Haaretz. Retrieved 22 October 2014. 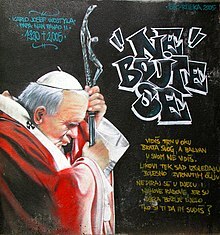 "Stasi Files Implicate KGB in Pope Shooting". Deutsche Welle. Retrieved 22 October 2014. 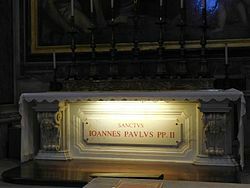 "Pope John Paul II's Final Days". St Anthony Messenger Press. AmericanCatholic.org. Retrieved 1 January 2009. Vinci, Alessio (1 April 2005). 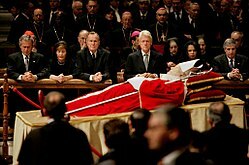 "Vatican source: Pope Given Last Rites". CNN. Retrieved 1 January 2009. Alessio Vinci; Chris Burns; Jim Bittermann; Miguel Marquez; Walter Rodgers; Christiane Amanpour; John Allen (2 April 2005). "World Awaits Word on Pope's Condition". CNN. Retrieved 22 October 2014.
de Montfort, St. Louis-Marie Grignion (27 March 2007). True Devotion to Mary. Mark L. Jacobson (Translator). San Diego, California: Avetine Press. ISBN 978-1-59330-470-6. Duffy, Eamon (2006). Saints and Sinners, a History of the Popes (Third ed.). Yale University Press. ISBN 978-0-300-11597-0. Mannion, Gerard, ed. (2008). The Vision of John Paul II: Assessing His Thought and Influence. Collegeville, Mn. : Liturgical Press. ISBN 978-0-8146-5309-8. Menachery, Prof. George (11 November 1978). "John Paul II Election Surprises". Noonan, Peggy (November 2005). John Paul the Great: Remembering a Spiritual Father. New York: Penguin Group (USA). ISBN 978-0-670-03748-3. Retrieved 1 January 2009. Navarro-Valls, Joaquin (2 April 2005). Il Santo Padre è deceduto questa sera alle ore 21.37 nel Suo appartamento privato [The Holy Father passed away at 9:37 this evening in his private apartment.] (PDF) (in Italian). The Holy See. O'Connor, Garry (2006). Universal Father: A Life of Pope John Paul II. London: 2005 Bloomsbury Publishing. ISBN 978-0-7475-8241-0. Retrieved 1 January 2009. Renehan, Edward; Schlesinger, Arthur Meier (INT) (November 2006). 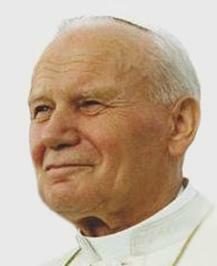 Pope John Paul II. Chelsea House. ISBN 978-0-7910-9227-9. Retrieved 25 February 2010. Stanley, George E (January 2007). Pope John Paul II: Young Man of the Church. Fitzgerald Books. ISBN 978-1-4242-1732-8. Retrieved 25 February 2010. The Poynter Institute (1 May 2005). Pope John Paul II: 18 May 1920 - 2 April 2005 (First ed.). St. Petersburg, Florida: Andrews McMeel Publishing. ISBN 978-0-7407-5110-3. Retrieved 25 February 2010. Wojtyła, Karol (1981). Love and Responsibility. London: William Collins Sons & Co. Ltd. ISBN 978-0-89870-445-7. Archived from the original on 11 February 2009. Retrieved 1 January 2009. Yallop, David (2007). The Power and the Glory. London: Constable & Robinson Ltd. ISBN 978-1-84529-673-5. Retrieved 1 January 2009. Wikimedia Commons has media related to Ioannes Paulus II.